You can convert the contents of a cell that contains a formula so that the calculated value replaces the formula. If you want to freeze only part of a formula, you can replace only the part you don't want to recalculate. Replacing a formula with its result can be helpful if there are many or complex formulas in the workbook and you want to improve performance by creating static data. You can convert formulas to their values on either a cell-by-cell basis or convert an entire range at once. Important: Make sure you examine the impact of replacing a formula with its results, especially if the formulas reference other cells that contain formulas. It's a good idea to make a copy of the workbook before replacing a formula with its results. This article does not cover calculation options and methods. To find out how to turn on or off automatic recalculation for a worksheet, see Change formula recalculation, iteration, or precision. When you replace formulas with their values, Excel permanently removes the formulas. If you accidentally replace a formula with a value and want to restore the formula, click Undo immediately after you enter or paste the value. Select the cell or range of cells that contains the formulas. If the formula is an array formula, select the range that contains the array formula. Click the arrow next to Paste Options , and then click Values Only. Press F9, and then press ENTER. After you convert the cell from a formula to a value, the value appears as 1932.322 in the formula bar. Note that 1932.322 is the actual calculated value, and 1932.32 is the value displayed in the cell in a currency format. Tip: When you are editing a cell that contains a formula, you can press F9 to permanently replace the formula with its calculated value. There may be times when you want to replace only a part of a formula with its calculated value. For example, you want to lock in the value that is used as a down payment for a car loan. That down payment was calculated based on a percentage of the borrower's annual income. For the time being, that income amount won't change, so you want to lock the down payment in a formula that calculates a payment based on various loan amounts. When you replace a part of a formula with its value, that part of the formula cannot be restored. Click the cell that contains the formula. 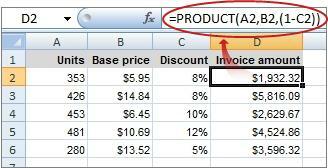 In the formula bar , select the portion of the formula that you want to replace with its calculated value. When you select the part of the formula that you want to replace, make sure that you include the entire operand. For example, if you select a function, you must select the entire function name, the opening parenthesis, the arguments, and the closing parenthesis. To calculate the selected portion, press F9. To replace the selected portion of the formula with its calculated value, press ENTER. In Excel Online the results already appear in the workbook cell and the formula only appears in the formula bar .